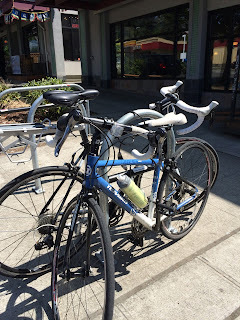 Just because I haven’t been blogging doesn’t mean I haven’t been riding my bike…although most of July and August proved to be much hotter than I enjoy. I probably did more swimming and Zumba classes than biking. But June was beautiful bike weather and toward the end of the month I returned to Bemidji, Minnesota – my second year attending the Northwoods Writers Conference. 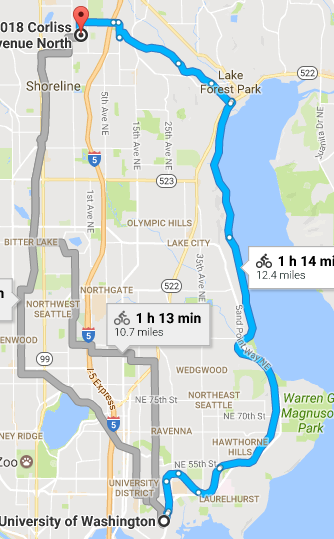 This year I felt like an old hand biking around the lake – a 17-mile loop. 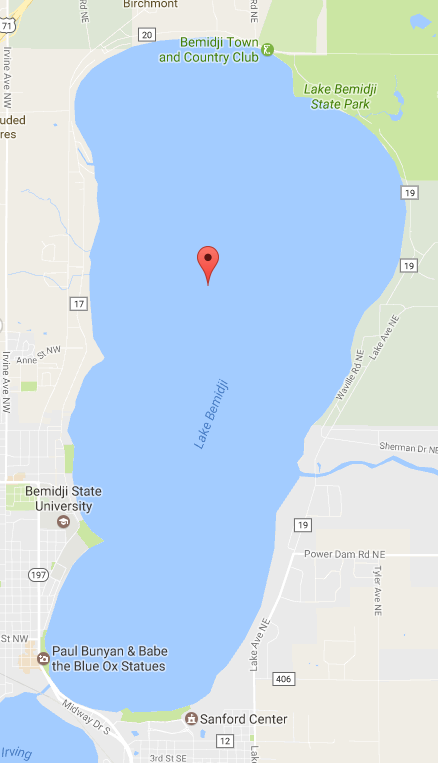 If Lake Bemidji was formed by Paul Bunyon’s right foot, the university (where the writing conference is held) would be at the lower part of the inner arch. Riding clockwise, there’s a long stretch along the inner arch of the “foot” that is probably the least enjoyable part of the ride. Although there is very little traffic, the route goes along the shoulder of a highway. 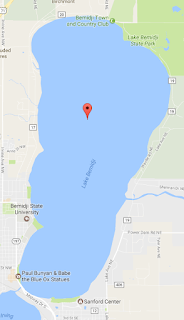 But once you round the top of the foot and get to about the fourth toe you enter Bemidji State Park – a beautiful forested area and a chance to swim in a cool, clean lake. Leaving the park, there is a long stretch of shady bike path. Almost directly across from the university is a bridge where you can see the Mississippi River flow into the lake and watch the young people jump from the bridge into the water. After rounding the “heel” you can see where the Mississippi flows out of the lake and from there it’s a short ride back to campus. 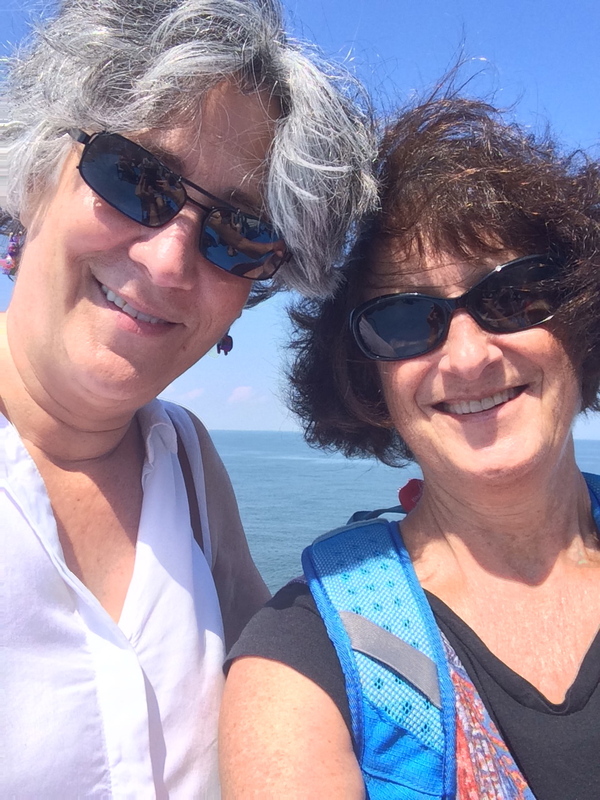 This summer I got to take the loop twice – once with my pal Tricia, who was my biking guide last year, and once by myself. The workshop was even better than last year, with inspiring writers, productive workshops, and new friendships. In July I had several trips that included modest amounts of cycling. There was a short jaunt to Stone Harbor, NJ, which included a prefect day for the ferry ride to Cape May. It’s always fun to ride at the beach in the early morning before the sun heats up and my friends have plenty of well-weathered bikes to borrow. Then it was up to Philly, where I left my dogs while the Cycling Yogi and I headed back to the West Coast. 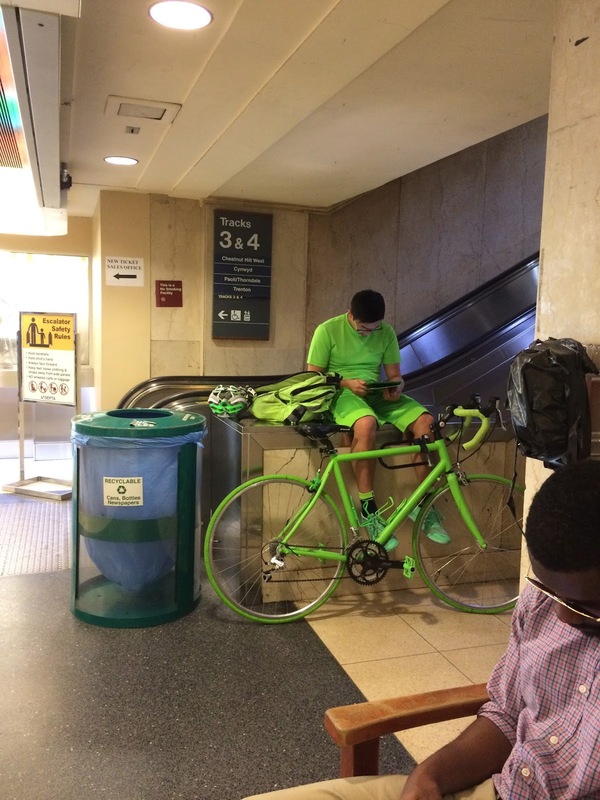 At 30th Street Station I saw a waiting commuter who seemed to be a bit obsessed with the color green. After a long weekend of hiking in the Northern Cascades we returned to our friends’ house which is a good 10 miles north of downtown Seattle. Fortunately they not only have a beautiful set of bikes for us to borrow; Seattle has a wealth of bike paths from which to choose. We rode into town on the Interurban trail and stopped for lunch at a place called the Wayward Vegan – which seemed like a perfect fit for the two of us. 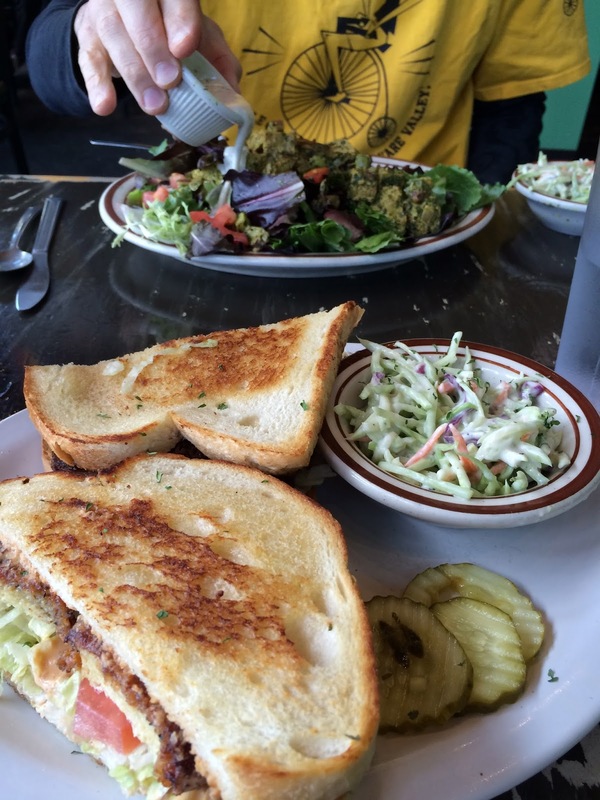 I decided to sample their version of the vegan fried chicken sandwich. 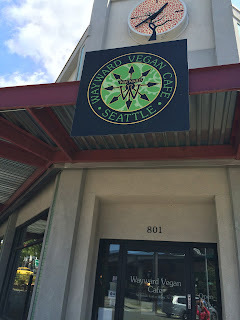 It was pretty good – but can’t hold a candle to NuVegan in DC. 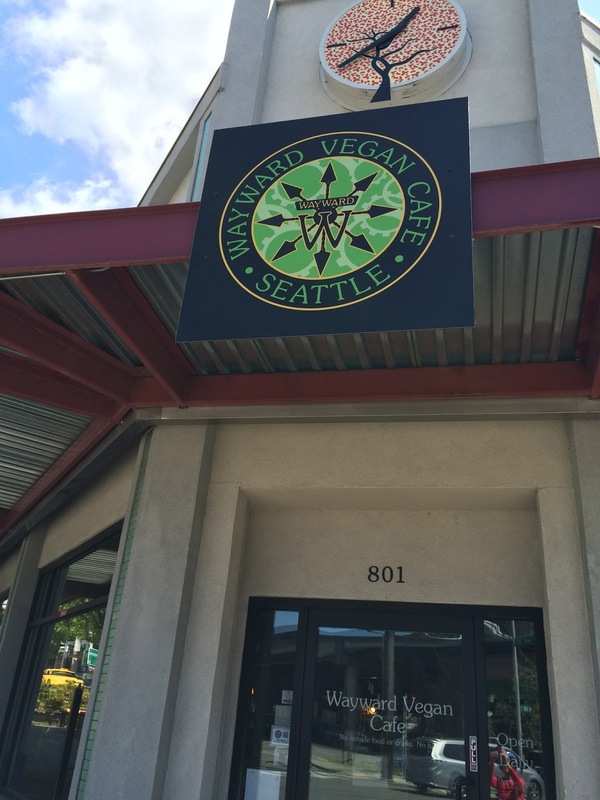 We're definitely wayward, and mostly vegan! 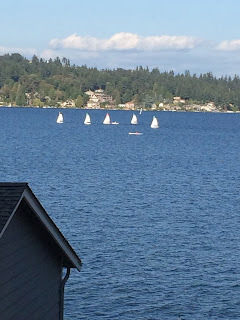 We returned via the Burke-Gilman trail – a slightly longer but more scenic route. 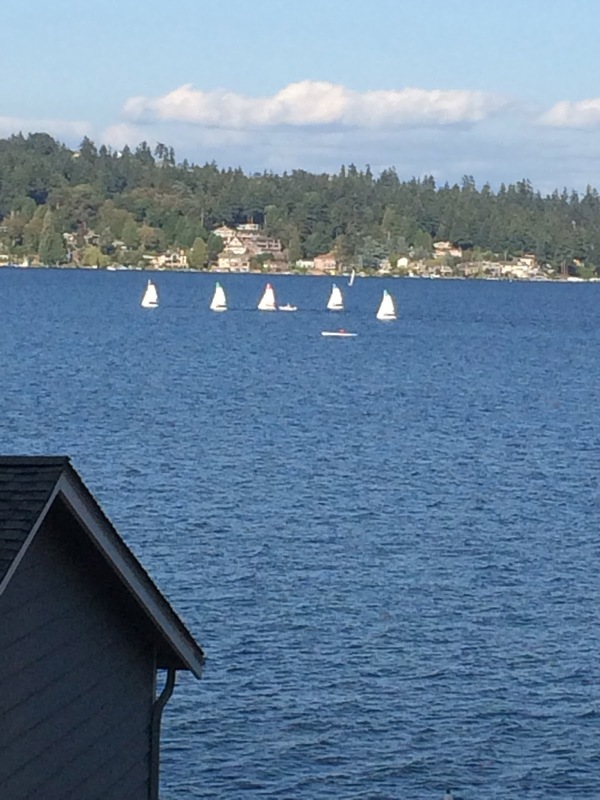 It goes along Lake Washington where gorgeous homes with breathtaking views abound (and are probably only affordable by dot.com multi-millionaires). From there, the Cycling Yogi departed for three months in Beijing, where I am soon to visit. I’m sure there will be some interesting cycling experiences in China! 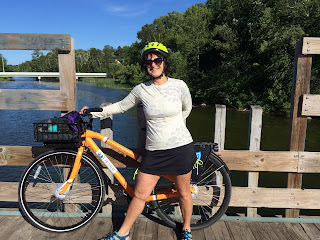 Post Script – in a previous post I mentioned biking in New York and taking in the Gustav Klimt exhibit at the Neue Museum. I was subsequently contacted by someone from an organization called Artsy, which endeavors to make art widely available to the public online. Here is a link to their page on Gustav Klimt – if there are any fans out there. Last month I came to New York for the day, on a train to Penn Station arriving before 11 for a noon appointment. I thought I’d take a Citibike downtown. It’s fun to go faster than the cars, and it’s the lifestyle I want to promote, even if it works out to more than twice the price of the subway, and I can’t claim it’s faster. Well, there were bike stalls lined up on 8th Ave just outside the station, but they were all empty. I walked a block to the other side of the station. There are four Citibike stations near the four corners around Penn Station, with room for 189 bikes in all. Every one was empty--not a bike to be had. When it got to be 11:30, I gave up walking and looking, and I got on the subway. 7 minutes to the front door of my downtown destination. Today I had another New York interview. This one was 11 AM, and I got to Penn Station at 10. Once again, all 189 Citibike stalls were empty. My keen scientific intellect began to discern a pattern. It turns out that this has been a problem at least since 2013. This time I had scoped out the next nearest station North and East where I was headed. I walked uptown about half a mile, and found plenty of bikes. I paid the $13 daily fee with a smile and set out to weave through the crosstown traffic to my destination, 3rd Ave at 47th St. I had mapped that out the previous night as well: a docking station conveniently located on 48th St, corner of 3rd Ave. But when I got there...yes, you guessed right. 55 docking stalls and every one of them had a bike in it. No place to return my bike. A young man in a Citibike T-shirt directed me to the next nearest station. “Concierge parking” he said. That one was full, too, but there were Citibike employees like him taking return bikes from riders, locking them in chains until a truck could come and port them downtown, or until the morning traffic reversed at the end of the day. I did as he suggested, and 10 minutes later I was walking in for my appointment. But I had walked almost half the distance, and the total time from Penn Station to 747 Third Ave was 32 minutes for 1.5 rectilinear miles--not any faster than I could have walked. Well, it’s been at least 3 years that Citibike has been working on this program. They’re buying trucks and hiring nice young men in Citibike T-shirts. But I have another idea. Are you listening, Citibike? Here are my proposed rules: If you pick up a bike from a station that is more than 90% full and you drop it at a station that is more than 50% empty, the system credits your account $5. Same $5 if you pick up a bike from a station that is more than 50% full and drop it at a station that is more than 90% empty. And if you port a bike from a station that’s more than 90% full to one that’s more than 90% empty, you can double-up and earn $10. From what I hear, Citibike is enormously profitable, thank you very much, and can well afford to pay the kids. Their increased ridership will more than pay for an army of 14-year-old bike porters. But if they really need to make more money solving this problem of their own bad planning, they could do it with surcharges. If you take one of the last 5 bikes at a station, there’s a $1 surcharge. If you take one of the last 4, it rises to $2...up to $5 extra for taking the last available bike. Same thing at the other end: If you fill the last empty dock, you are charged an extra $5. Second-last empty dock: $4, etc. This is the direction the economy is moving. Craigslist and Uber and Air-BnB are signs on the wall. It’s not the top-down Corporate Model that Citibank is used to, but hey--we’ve all got to adapt.